In the weeks around Easter, students were on vacation and you could see them in great numbers in organized groups doing something during this time. A lot of them visited the peace tower across the river. Others I could see in groups of bikers, campers and in kayaks. It seems that for Easter vacation, it is typical for students to do something in a group, perhaps an organized group or club. One Saturday, a large number of people came down the river on kayaks. I would estimate 200 or 300 during the day. For some of this time the weather was very nice and I am sure they enjoyed getting some sunshine here in Belgium. There is a business in town renting the kayaks. We have a dingy on the boat and I have toyed with the idea of replacing it with 1 or 2 kayaks. What do you think? It is also spring time and with that comes the smell of farming. 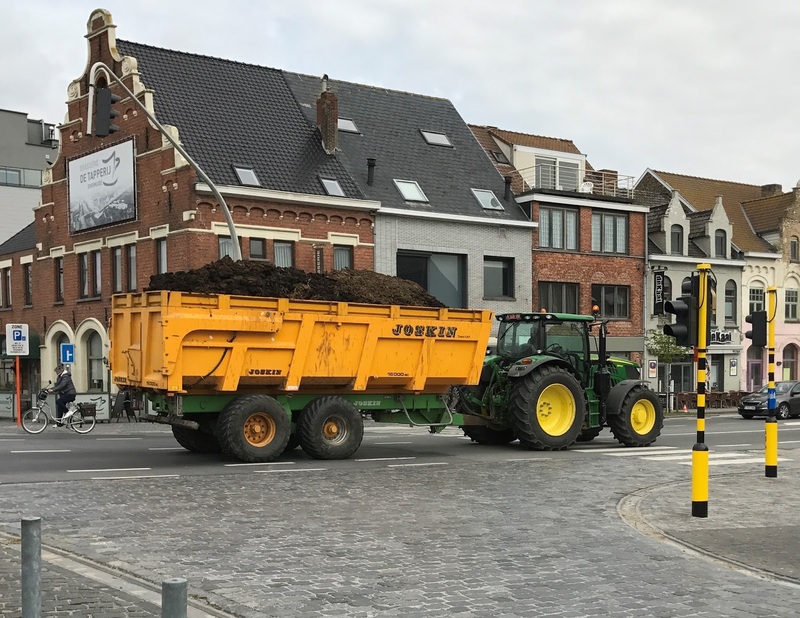 Yes, they are spreading manure. It is always in the air and in some cases being transported through town in large tanks or wagons. 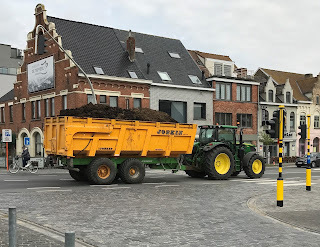 There is no bypass around Diksmuide so all traffic, small and large, comes through town. A lot of hauling is done in wagons pulled by farm tractors. What we would typically see hauling stone or dirt, a dump truck, is here pulled by a farm tractor. Hundreds going through town each day.